Lawyer Mary Jean Reimer, center, outside the court today. 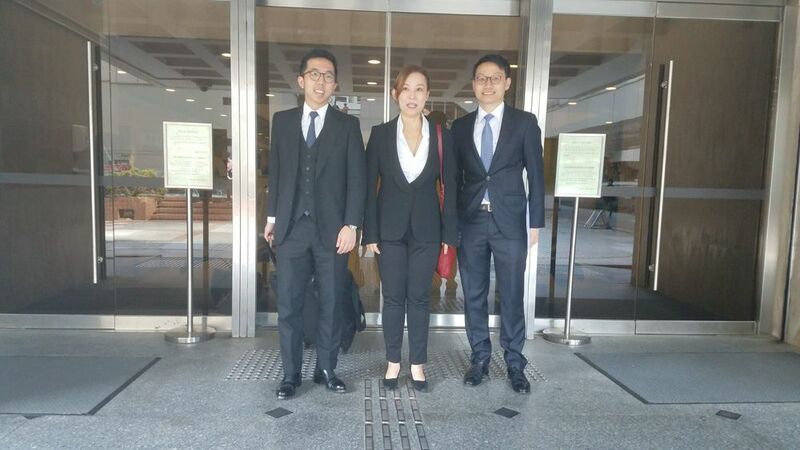 Lawyer Mary Jean Reimer, also known as Yung Jing-jing, appeared at a closed door chamber hearing in the High Court for appointment of liquidator today after she filed a winding-up petition against the scandal-hit Ting Wai Monastery in Tai Po again. In an exclusive story yesterday, Headline Daily, the sister paper of The Standard, reported that the Secretary of Justice, as the Protector of Charities, has decided to be involved in the case. The hearing took about 45 minutes today and Justice Jonathan Harris adjourned the case until November 27. It is reported that the abbess Sik Chi Ding, accused of extravagant spending and engaging in fake marriages two years ago, will send a legal representative to the next hearing. Speaking outside the High Court, the Buddhist and former actress, who is also a board member of the monastery, said she was positive about the hearing but did not reveal details as it was behind closed doors. Reimer added that she believed there is justice in society and has full confidence in the court.